Why some people hate vegetables and what can they do about it. In today’s fast-food society, it’s not uncommon for people to have an aversion to vegetables — actually, they hate vegetables! Of course, this can make becoming a vegetarian, vegan, worse, a raw foodist a little daunting. When I became a vegetarian 40 years ago, people thought I was very strange. Now, after 40 years, being a vegan or vegetarian diet is at least considered healthy, even if a little unusual. It took 4 decades for me just to get to where people at least accept being vegan or vegetarian as a somewhat reasonable idea. 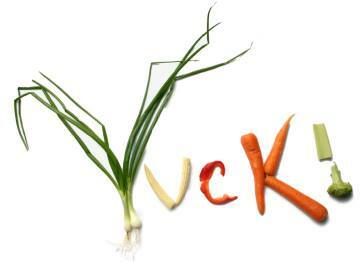 Now we are asking people to accept not just eating mostly vegetables as a way of life, but actually eating them raw! For some people that’s much more than just hard to accept – many people just won’t even try them. They just hate vegetables! According to the U.S. CDC, about 75% of Americans don’t eat the recommended five to nine servings of fresh fruits and vegetables per day. That’s alarming, considering how important vegetables are to maintaining a healthy and productive lifestyle — but not surprising, given that some people think that ketchup counts as one serving of vegetables! So when you get to a buffet do you choose the chocolate cake over the carrot sticks even though you know carrot sticks are healthier? Do you skip the salad at the restaurant? Does the idea of eating something green make you gag? Well, many people new to raw food are confronting just such a challenge! They didn’t get interested in the raw food lifestyle merely because they thought it’s delicious – they were overweight or they got sick. Usually that is how they got here – raw food may have been their last resort. They studied raw nutrition, they’ve read stories about people who’ve overcome the very dis-ease they are struggling with using a raw food diet – but it didn’t help. Veggies still make them gag. If vegetables weren’t good for you, you could simply eliminate them from your diet without any consequences. But in fact, that is what most people in our so-called civilization have done – and it has led to a society with more health problems than ever – from rampant obesity and diabetes to epidemic of cancer and heart disease. So how did we get here? How did we turn our natural taste for things that are good for us, which we evolved with, into an addiction to things that are bad for us – and even an aversion to the good stuff? The answer is money. Over the last 100 years or so we surrendered our responsibility for what we eat into the hands of big business. In effect, we surrendered the responsibility for our nutrition into the hands of corporations who are legally obligated to put profit before nutrition – so they did. Now we can buy a whole fast food meal for $1.99. Maybe even less – I’m not sure since I haven’t been to a fast food joint in 30 years. I believe that big business, in their never-ending “fiduciary responsibility” to the Gods of Profit, spent the last 100 years developing various ways to sell more of their products, reduce their costs and increase their profits – at any cost! The results is a testament to the effectiveness of their efforts – people are addicted to artificial preservatives, sweeteners, genetically modified foods and more to such an extent that the delicious natural taste of vegetables now makes them gag! Big business has evolved a new breed of human being, one that with the help of modern pharmaceuticals can manage to survive to a ripe old age without ever eating anything that is truly healthy. One of the main culprits is sugar. In fact, if you really do hate vegetables, don’t blame the veggies — you are probably just addicted to sugar. Today there is some sort of sweetener in absolutely every single food that is commercially prepared. It’s not just cane sugar, since we all know to avoid that, it is all the sweeteners – some with innocuous names you don’t even know mean “sugar”! One of the worst is “high fructose corn syrup” (HFCS). “Corn? How bad can that be?” you ask. Well, it’s very bad actually, since HFCS today comes from a variety of genetically engineered corn that isn’t even edible by humans any more! This isn’t the “corn” you think about when you go to the supermarket – it’s designed for motor vehicle fuel and sugar production, and is even sweeter than regular sugar! This innocuous-sounding product has been linked to obesity and type 2 diabetes and has become perhaps the leading source of added sugar in our diet. There is some kind of sweetener in things that don’t even taste sweet. What’s that about? It is all about creating an addiction … because addicts are the best customers of all. And now that your taste for sweets has been properly programmed, the natural taste of nutrient dense organic vegetables won’t satisfy your sweet tooth. In fact, because they are very “alkaline forming,” they may initially taste bitter or nasty to you — and so you may actually hate vegetables. However, veggies are really not bitter at all, but without all the sugar that you’re addicted to these days you may think they are. The healthier the veggie the worse it tastes! So what are you to do? To start out, you have to make a decision or commitment to change. You’ll need to accept that it will be difficult at first, so the first thing you have to change is the way you think about vegetables before you eat them. If you look at a veggie and think, “this is awful,” before it even gets in your mouth, you are not going to like it no matter what you do. You need to discard that initial reaction to your veggies. If you can do that, you can re-train your taste buds. 2. Re-train Your Taste Buds. We evolved over millions of years to enjoy the taste of foods that are good for us. It took less than a century for big business to retrain our taste buds to prefer things that are bad for us. They did that by making bad things taste like good things. Many good foods have a little sugar in them. There is nothing wrong with that. Lots of good healthy foods have a little MSG in them. Yeah … it’s true. Our taste buds evolved so you would like a little MSG. Then big business decided to make artificial MSG that they could add to their empty-calorie foods so you would like those better. The good news is that natural foods are where the artificial sweeteners and “flavor enhancers” got their inspiration in the first place! So it is not all that hard to learn to enjoy them. Your taste buds aren’t broken, they just need to be retrained. By weaning yourself off of the things that confuse your taste buds, like artificial flavors and sweeteners, they can begin to return to normal – and eventually actually develop the ability to taste – and enjoy – the natural nutrition in the foods you put in your mouth! 3. Why all Vegetables are Not Created Equal. Which veggies look more alive and healthy to you? When I was just a kid I really thought I hated vegetables. I didn’t actually hate vegetables at all, but I really, really hated those awful mushy, nasty things Mom pulled out of the freezer or dumped from a can onto my plate. Then I discovered that those nasty things weren’t real vegetables at all -– they’re something else, a shadow of their former selves. You see, when you overcook, freeze, genetically engineer and otherwise “improve” a vegetable it becomes something else. It isn’t truly a “vegetable” any more – really! It actually has been chemically changed by cooking and processing to the point that it certainly isn’t food any longer. It doesn’t taste like real food (once you re-learn what real food tastes like, that is). In fact, it doesn’t even taste good without a lot of salt and artificial (or so called “natural”) flavorings that aren’t good for you either. On the other hand, fresh organic nutrient-dense vegetables taste wonderful, even with nothing on them! I love just plain broccoli or cauliflower. A carrot is like dessert. Avocados – yum! But take a plastic bag of frozen broccoli, peas and cauliflower, boil it into a limp slimy green mess until it stinks like rotting garbage, slop a ton of margarine and salt on top to hide the taste (doesn’t help the smell though) – and no wonder you hate vegetables! If you had to cope with that when growing up, you’ve been scarred for life! So to change that pattern, you need to realize that the taste of a vegetable changes drastically depending on how it’s cooked –- or in my case, NOT cooked! The taste of raw organic veggies is wonderful to me now, and it will be to you. I promise! To ease your transition, you can try lightly steaming your veggies, or lightly cooking them with a minimum of organic olive oil in a wok. 4. Stick with your program. In this age of processed foods and sugar-addictions, the poor vegetable can’t possibly have the appeal of a chemically-processed burger that’s been field-tested by marketing and psychology experts who know all your buttons. Making a transition to real, organic, whole food isn’t going to happen overnight. So once you get past your initial disappointment in your vegetables, keep eating them anyway. Eventually, you’ll begin to appreciate them, and then even really desire them. But you must stick with the program. Don’t give up just because that pizza is still calling to you. But if you can’t stand it any more, go ahead and have a slice! Sometimes you have to treat yourself compassionately – don’t give in easily, but don’t make it such a burden that you resent what you are trying to achieve and stop altogether. After the pizza, topped with veggies perhaps, you can get back on the horse and keep on riding. 5. Eat your veggies with other foods. When you get started, try masking the initial taste of vegetables. A salad dressing you like will make your salad go down easier. I used to get “salad pizza” at my favorite pizza place – a big delicious fresh salad right on top of a slice! Mix toasted almonds or sesame seeds in with your vegetable dish. If you are used to salty things, get some dulse flakes at your local health food store and sprinkle those on instead – or mix in any sea vegetables with your fresh veggies. Juice bars are popping up all over, providing a fresh, tasty alternative to eating vegetables. Keep in mind that even fresh juices are powerful, concentrated foods, and some commercial juice bars include additives like sugar, flavorings or even dairy products. 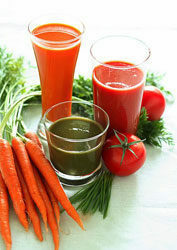 Juiced veggies also don’t have the fiber you get from their whole counterparts. I always tell people to “chew your juices and drink your solids.” You see, digestion starts in the mouth, so for optimum digestion you want to chew solids enough to liquefy them and “chew” liquids to mix them with the enzymes in your saliva. Even more convenient is to get a juicer for your home. I recommend the Green Star Elite, a twin-gear masticating juicer that I use myself. It is the best bang for the buck because it does everything, including wheatgrass, has a slow-speed 80 RPM motor, reducing heat and oxidation for optimum nutrition, and cleans up in just a few minutes. 7. Transform your veggies into sauces, soups, toppings and garnishes. Tomato sauce, some salad dressings, and salsas are just a few of the recipes you can find for making vegetables more palatable. You can even make delicious raw soups. My books have plenty of recipes. Mix vegetables with ginger, Braggs Amino’s (used sparingly), apple cider vinegar, and sesame oil to make a healthy salad dressing. Half a cup equals one whole vegetable serving. Hate vegetables? If not 100% raw yet, you can add your veggies to other dishes. Top a pizza with fresh broccoli or cauliflower – don’t knock it til you try it! Just crumble up or finely dice the tops first then sprinkle them right on the pizza. Of course, there’s also spinach, mushrooms and peppers, but use them RAW! Toss some fresh sprouts and tomato slices on top for delicious pizza, or add them to any kind of sandwich. Many people hate vegetables because they’ve never tried anything other than peas and carrots. Try something new — you never know what you may discover. Sure, you’re bored with tomatoes, potatoes and iceberg lettuce — so give eggplant or arugula a try! All have very different textures and flavors and are full of nutrients. Ask your local grocer for recommendations or check out the recipes in one of my e-books. Many raw vegetables make great snacks just by adding hummus, salad dressings and salsa. Keep them ready for quick easy access by cleaning them when you get back from the store. Cut them into bite size bits and store in the green bags you can get at health food stores. I keep them at eye level in my refrigerator so I see them first whenever I get the munchies. Broccoli, cauliflower and carrots go well with just about anything, and organic baby tomatoes can be eaten just by themselves. When you think about vegetables, you probably think green. But vegetables come in a wide variety of colors, from red to purple, yellow to orange. Each color brings a whole new set of vitamins, minerals and flavors to your table. Fresh, in-season, locally grown vegetables offer the most flavor and nutrition. For example, asparagus is ideal in the spring. Arugula, corn and tomatoes are best in the summer. Broccoli, eggplant and pumpkins reach their peak in the fall, Many green veggies are best in the winter. Try growing some vegetables in your own organic garden. It’s very hard not to like vegetables that you grew yourself. In the end, you may find out that you actually don’t hate vegetables, you just hate them prepared in the ways you’ve always tried them. So give some new recipes a try and eat them raw! I suspect you will surprise yourself.